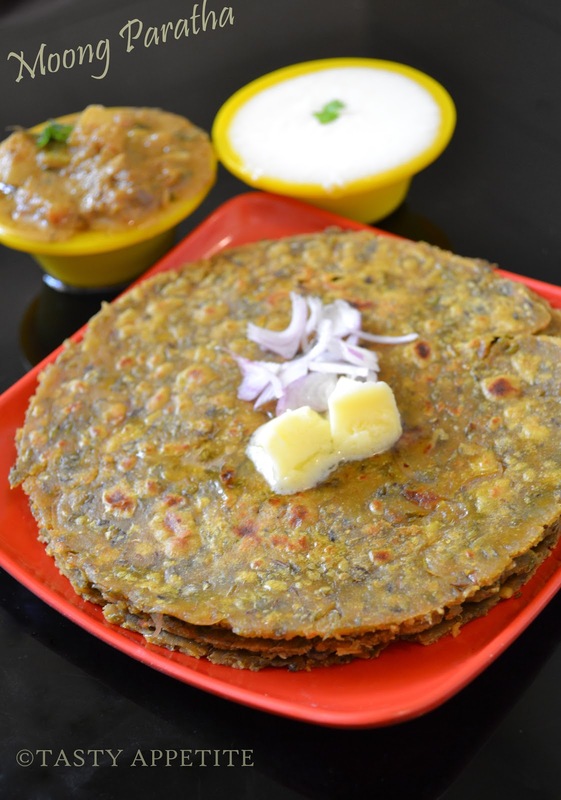 Moong Dal Paratha is another healthy & popular flatbread of Indian cuisine..!! Among the stuffed parathas, moong paratha is something different & is much healthier coz of its protein value. 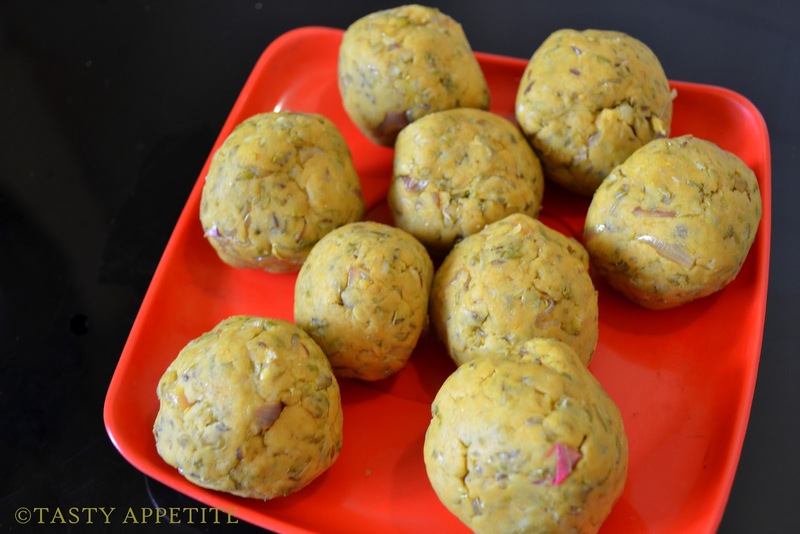 In this recipe, the moong dal is steamed & sautéed in mild spices, then combined with wheat flour & kneaded together to smooth dough. 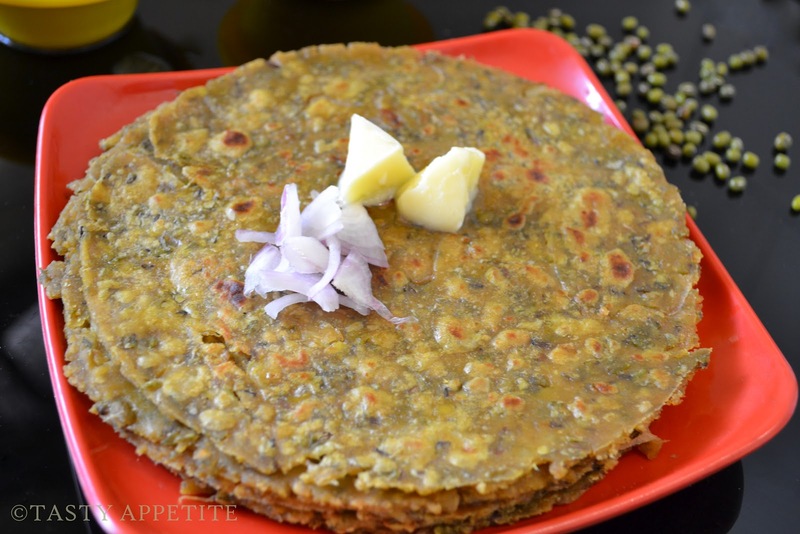 This paratha tastes awesome & we can enjoy it for breakfast or for dinner with plain curd & any curry as side dish. It makes a complete meal in itself...! 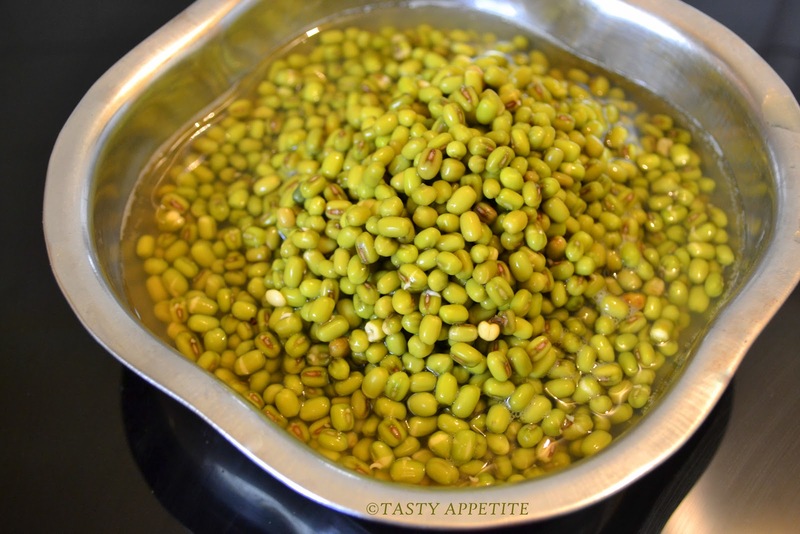 Wash & soak Moong dal overnight. In a non-stick pan, heat 1 tsp oil. Add cumin seeds, wait to crackle. Add finely chopped onion and sauté till transculent. 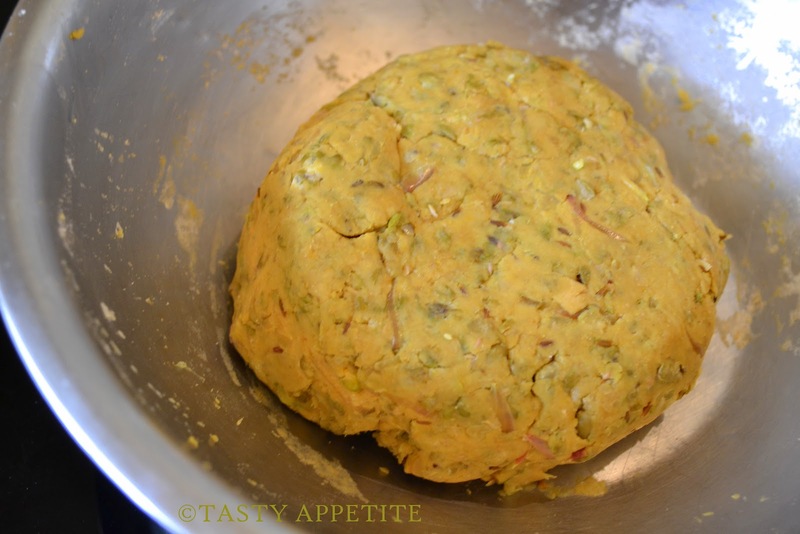 Add chilly pwd, coriander pwd, turmeric pwd, salt & mix well. Add cooked moong dal and combine gently. Turn off heat and let it cool. Add a tsp of lemon juice, finely chopped coriander leaves and mix well. 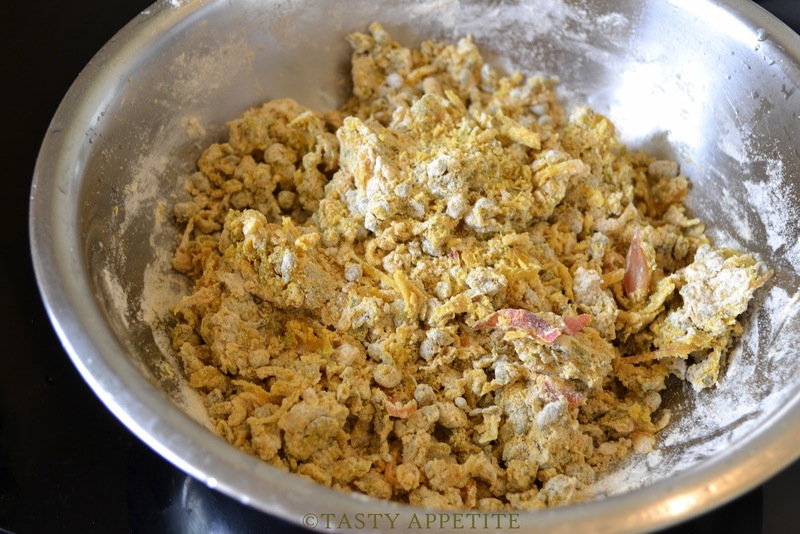 In a wide bowl, take wheat flour with ½ tsp salt. Add the moong dal mixture prepared above. Slowly add some water and knead it. Add a tbsp of oil and knead it , until it forms a smooth dough, to be able to roll. Cover it with a plastic wrap & let it sit aside for at least 20 mins. With a rolling pin, roll it to desired thickness & your comfort level in rolling. Sprinkle some wheat flour , if necessary to prevent sticking. Place the rolled paratha in the tawa. Cook for about half a minute, flip over & drizzle oil or ghee in around the paratha. Keep pressing the paratha while on skillet, so the dough gets cooked soft. Flip & cook the other side. Cook until light golden spots appear on the paratha. Take it off from heat. Repeat this process with the other parathas. 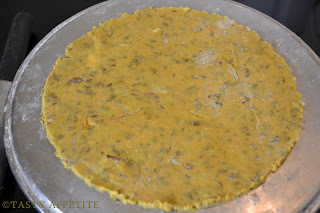 Moong dal masala parathas are ready. Serve hot with a side of plain yoghurt, chutney or your favorite curry and savour it. This is so healthy. Looks beautiful. Very nutritious n yummy paratha...wonderful preparation n looks so inviting!! Neatly presented dear!! With so many versions of paratha from u, I'm spoilt for choice! Very high in fiber. Definitely the best choice for breakfast. Nice, homemade paratha! It's luxurious to have this in the morning...considering it's homemade! Yum! this is great!........i love the addition of a little sourness..very nice! 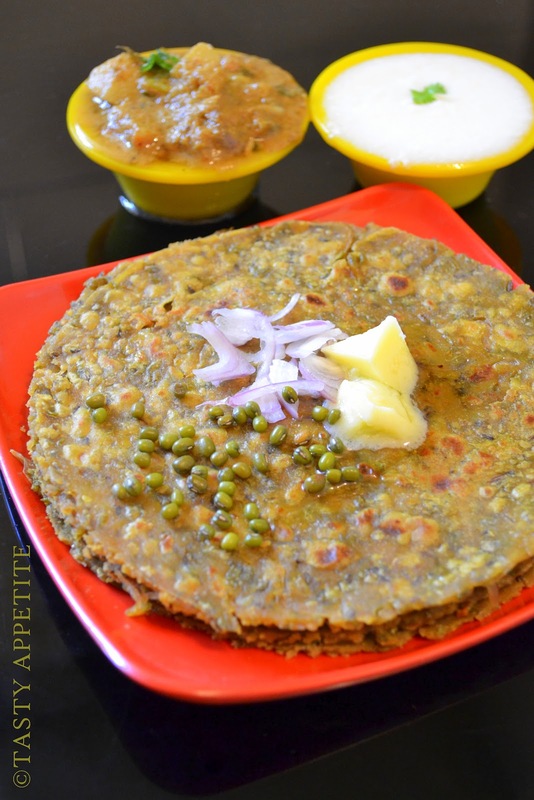 Healthy paratha.....nice breakfast recipe...looks yumm. I love paratha..whenever we go for Indian food, I will order paratha other then the roti canai. I know it is healthy but I didn't know so much of moong bean needed to make this and yours is so so delicious then the want we have here. Healthy Combo Jay! How much Wheat flour we should use for this recipe? Protein rich and healthy parathas. Buy Twitter Followers, Facebook Likes, Photo Likes only on Buysocialikes Click Here To Get the coolest offers. Mom was askin for moong dal paratha just sometime back!! Bookmarked this delish version...Thx Jay!! Nice parathas..unlike the stuffed ones, you have mixed everything..love it. 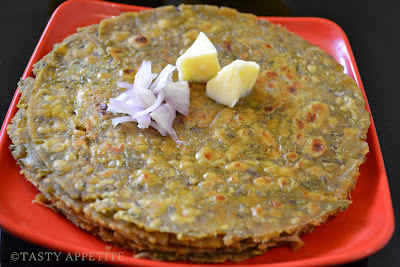 hi jay, i wish the restaurants over here make this mung dhal paratha , then i can have this for breakfast. This one I am bookmarking Jay. So nice and also healthy! Looks really yummie!! I have never had these. They look really good and I like that they are versatile. Very healthy with the whole moong, looks superb.. I love really savory food for breakfast! this sounds so tasty! This does sound like a meal in itself! The dal and spices sound delicious in it. 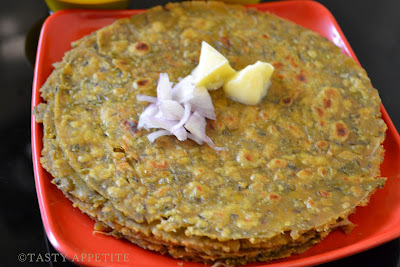 wow....healthy and delicious paratha....think you did not smash those moong dal. was it easy to knead and spread the parathas??? This one has been on my mind for a long time.. now seeing these yummy pics I have to make it soon!! I make it with moong dal(yellow), will try your version with moong beans. Nice pictures! best paratha I have come across. 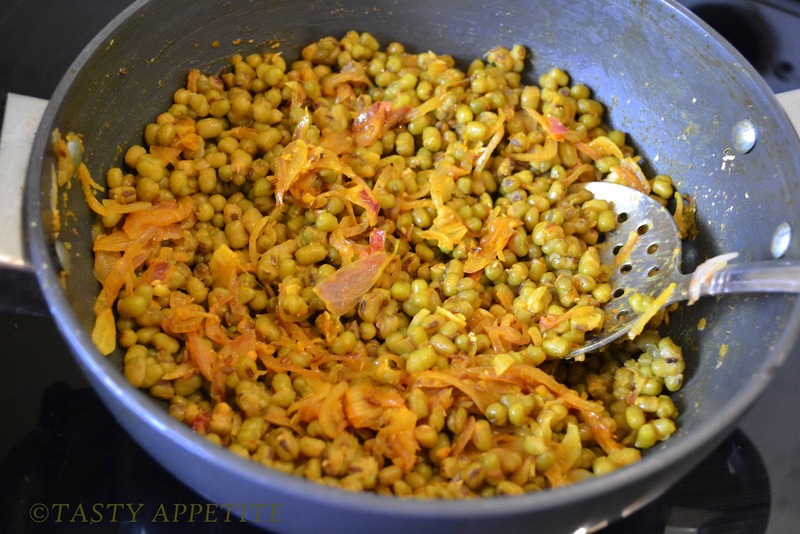 This is yum way to get my moong in them all.And no stuffing around. Thanks. A superb recipe. I will make it for my family. Thanks for step by step instruction. Jay, thanks for dropping in my blog Pachanti, ur blog is so awesome, wonderful recipes, keep them coming. A marvelous mouth watering item to view on a Saturday morning ! Looks so yummy & delicious ! this looks like a very healthy option for breakfast and delicious too! Wow! that is one amazing recipe Jay :) Bookmarked! Yummy ,healthy and delicious paratha.. This is new to me Jay but sure love the beans because they are so nutritious, what more your recipe is so easy to be picked up. I want to go have breakfast at your place; sure looks good. Very yummy n protein packed parathas, looks so inviting. So good to see a recipe for these-thank you Jay!! Looks so tempting. Nice dish. C'est sain et nutritif. J'aime beaucoup. Looks yummy and sinful with all that butter on top!! hey!! today i made this paratha for breakfast... really good.. thanks for the recipe..